Skateboarding luminary Tony Hawk enters Larry King’s hot seat, dishing out details about his new video game, dispelling skater stereotypes, and describing the current state of the sport. 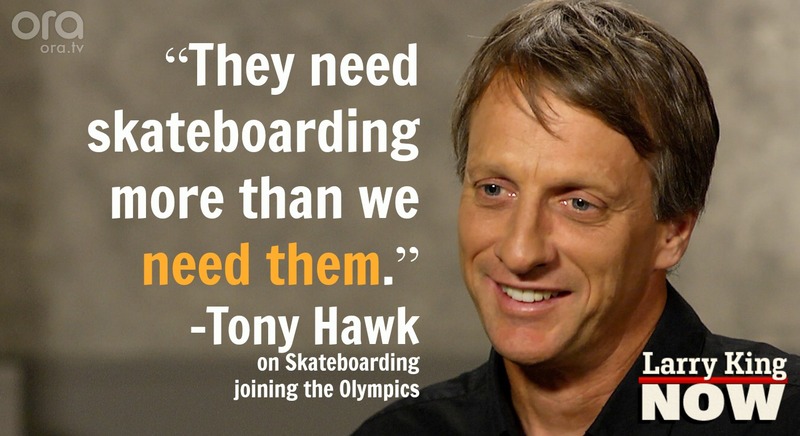 Plus, Tony’s views on skateboarding as an Olympic event. Skateboarders Nowadays - Tony Hawk comments on the current state of the skateboarding community. My New Game Will Be On Mobile Devices - Tony Hawk reveals exclusive details about the newest addition to his hugely popular video game series. I Must Continue To Walk The Walk - What does the future hold for Tony Hawk’s skateboarding career? Skateboarding At The 2020 Tokyo Olympics - Tony Hawk delivers his views on the potential for skateboarding to join the 2020 Tokyo Games event roster. Bart Simpson Was My Roady - Tony Hawk answers social media questions from fans.